7 7/8 in. (20 cm.) diam. 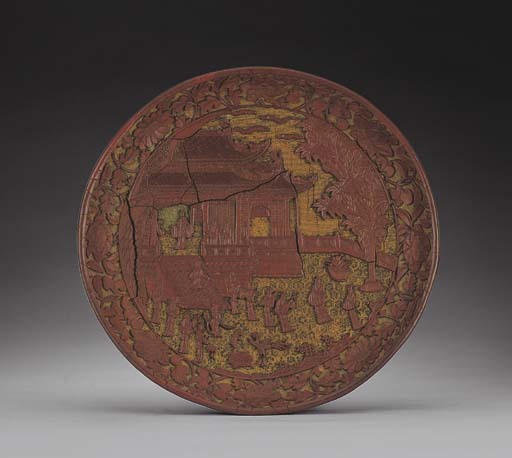 A comparable dish dated to the Hongzhi period and carved with a palatial scene on a yellow ground, is in the British Museum, illustrated by Derek Clifford, Chinese Carved Lacquer, London, pl. 58. Cf. also a mid-Ming dynasty square dish decorated with figures in leisurely pursuits on palace grounds, illustrated in Zhongguo Qiqi Quanji, 5, pl. 50; and a Hongzhi period large hanging plaque carved with red and yellow lacquer with an elaborate palace scene, from the Palace Museum, Beijing, illustrated ibid., pl. 49.